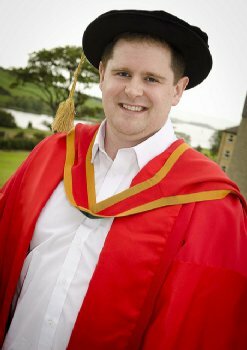 Belfast man, Barry Kerr, who is involved in research to develop new treatments for diabetes today receives a PhD at the University of Ulster’s summer graduation ceremonies at Coleraine. His doctoral research explored ways to combat Type 2 diabetes through chemically modifying gut molecules produced naturally in the body. Barry explains: “Gut molecules produced in the intestine are released following eating. Once in the circulation they stimulate the secretion of the hormone insulin, which lowers blood sugar concentrations as well as suppressing appetite. Barry’s research was supervised by Dr Victor Gault and Professor Peter Flatt, both members of the internationally recognised Diabetes Research Group at Ulster’s Coleraine campus. Dr Gault says that one of the bonuses of exploiting naturally occurring molecules is that they are much more likely to be better tolerated by the body than synthetically-manufactured therapeutic agents. “The work reported in Barry’s thesis clearly illustrates that even simple chemical modifications, such as single amino acid replacement, significantly improves the biological efficacy of key gut molecules. Barry, who graduated with BSc Hons in Sports Exercise and Leisure from Ulster in 2004 and is currently studying Medicine at the University of Dundee, admits that his career path to date has not quite followed a conventional path. His PhD research in turn prompted an interest in Medicine and he has just finished his first year as a Medical student at Dundee. A former pupil of St Mary’s CBS on the Glen Road, Belfast, Barry is a keen exponent of the martial arts and has been helping out at his alma mater by running strength and conditioning classes for the pupils.